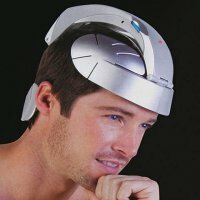 This Head Spa you see here is not some new-fangled brainwashing device from the FBI, but it is supposed to reduce stress and tension in your head by increasing the blood circulation in addition to stimulating your scalp using the acupressure technique. The patented design is lightweight and easy to use while at your office desk, on the morning commute, or while enjoying your evening television program. It costs $49.95 and a big chunk of your dignity as well as self-respect whenever you wear this in front of your family.